COME ENJOY PANORAMIC VIEWS FROM OUR PRIVATE 2500 ACRE PARADISE HIGH ON THE CONTINENTAL DIVIDE. 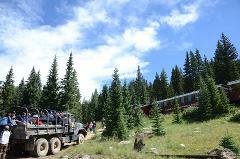 WE ARE THE HIGHEST ZIP LINE AND THE ONLY ZIP LINE IN THE WORLD TO FLY OVER A RUNNING TRAIN. 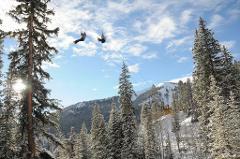 Experience an Exciting WINTER WONDERLAND Snow Cat/Zip Line Tour at the Top of the World in the Colorado Rockies. Explore our unspoiled 2,500 PRIVATE property from 10,000 to 12,800' high on the Continental Divide by zip line. Combine a guided White Mountain 2-Hr. 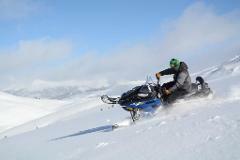 Performance Snowmobiling Tour with all Six sections of our Top of the Rockies Winter Zip Lining Tour. Add a thrilling snow cat shuttle up the mountain plus a delicious lunch for the Ultimate Adventure. 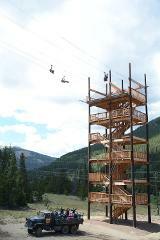 TOP OF THE ROCKIES ZIP LINE IS THE HIGHEST AND THE ONLY ZIP IN THE WORLD TO FLY OVER A RUNNING TRAIN. FLY ON TWO SEPARATE OVERHEAD CABLES WITH A DOUBLE HOOK-UP TO YOUR HARNESS. SELF-BRAKING IS NOT REQUIRED. ALL TRAILS ARE DOWN-HILL. Combine a guided White Mountain Prospector Tour (Adults riding single or Adults with passengers) with all 6 Sections of our Top of the Rockies Winter Zip Lining Tour. A Delicious Box Lunch is included. BOOK THE ROCKY MOUNTAIN CHALLENGE AND EXPERIENCE TWO SEPARATE GUIDED SNOWMOBILE TOURS IN TWO DIFFERENT RIDING AREAS, PLUS LUNCH WITH YOUR GUIDE. GRATUITY IS INCLUDED. Book this three-hour HIGH ADVENTURE tour only if you have driven snowmobiles before and are looking for the best terrain and the most experienced guides in the business. This tour is also called "THE EXTREME". TWO-HOUR PROSPECTOR SNOWMOBILE TOUR: Ride Single or Carry a Passenger on this two-hour tour on groomed trails with spectacular views of 14,000' mountains. This tour is great for families and couples who want to ride together. The Two-Hour HIGH ADVENTURE TOUR is for experienced single riders wanting an advanced and challenging ride at altitudes from 10,000' to 12,800' on the slopes of Mt. Arkansas. Our guides will show you how the locals ride. Ride at the Top of the World in the Colorado Rockies. White Mountain Snowmobile Tours is the Premier Snowmobile Outfitter in Colorado with 30 years of experience and thousands of repeat customers. All tours are guided. 3-HR HIGH ADVENTURE SNOWMOBILING TOUR (The Extreme) with ALL SIX SECTIONS OF THE TOP OF THE ROCKIES CONTINENTAL DIVIDE ZIP LINE TOUR, LUNCH IS INCLUDED. Price includes gratuities for snowmobile & zip line guides. ENJOY ZIP & LUNCH , SURROUNDED BY THE TALLEST MOUNTAINS IN NORTH AMERICA. SHARE OUR 2,500 ACRE PRIVATE PARADISE AT THE TOP OF THE WORLD WHERE IT IS ALWAYS COOL AND COMFORTABLE EVEN IN SUMMER. NO ZIP FLIES HIGHER. CHECK IN AT 11:00 A.M.